This article is about the power system for railways. For other uses, see Third rail (disambiguation). For the railway employee, see Conductor (rail). Third rail (top) at Bloor-Yonge station (Line 1) in Toronto, ON. for the Toronto Transit Commission. Energized at 600 volts DC, the third rail provides electrical power to the power-train, and ancillaries of the subway cars. A British Class 442 third-rail electric multiple unit in Battersea. The maximum permitted speed of these units is 100 mph (160 km/h). Paris Metro. The guiding rails of the rubber-tyred lines are also current conductors. The horizontal current collector is between the pair of rubber wheels. A picture of an NYC Subway train making contact with the Third Rail. The rail in the foreground is the third rail for trains in the opposite direction. A third rail is a method of providing electric power to a railway locomotive or train, through a semi-continuous rigid conductor placed alongside or between the rails of a railway track. It is used typically in a mass transit or rapid transit system, which has alignments in its own corridors, fully or almost fully segregated from the outside environment. Third rail systems are always supplied from direct current electricity. The third-rail system of electrification is unrelated to the third rail used in dual gauge railways. Third-rail systems are a means of providing electric traction power to trains using an additional rail (called a "conductor rail") for the purpose. On most systems, the conductor rail is placed on the sleeper ends outside the running rails, but in some systems a central conductor rail is used. The conductor rail is supported on ceramic insulators (known as "pots") or insulated brackets, typically at intervals of around 10 feet (3 metres). 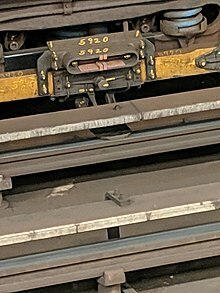 The trains have metal contact blocks called collector shoes (or contact shoes or pickup shoes) which make contact with the conductor rail. The traction current is returned to the generating station through the running rails. In the US, the conductor rail is usually made of high conductivity steel or steel bolted to aluminium to increase the conductivity. Elsewhere in the world, extruded aluminum conductors with stainless steel contact surface or cap, is the preferred technology due to its lower electrical resistance, longer life, and lighter weight. The running rails are electrically connected using wire bonds or other devices, to minimise resistance in the electric circuit. Contact shoes can be positioned below, above, or beside the third rail, depending on the type of third rail used: these third rails are referred to as bottom-contact, top-contact, or side-contact, respectively. The conductor rails have to be interrupted at level crossings, crossovers, and substation gaps. Tapered rails are provided at the ends of each section, to allow a smooth engagement of the train's contact shoes. The position of contact between the train and the rail varies: some of the earliest systems used top contact, but later developments use side or bottom contact, which enabled the conductor rail to be covered, protecting track workers from accidental contact and protecting the conductor rail from frost, ice, snow and leaf-fall. Because third rail systems present electric shock hazards close to the ground, high voltages (above 1500 V) are not considered safe. [dubious – discuss] A very high current must therefore be used to transfer adequate power, resulting in high resistive losses, and requiring relatively closely spaced feed points (electrical substations). The electrified rail threatens electrocution of anyone wandering or falling onto the tracks. This can be avoided by using platform screen doors, or the risk can be reduced by placing the conductor rail on the side of the track away from the platform, when allowed by the station layout. The risk can also be reduced by having an insulated coverboard to protect the third rail from contact, although many systems do not use one. In some modern systems such as the ground-level power supply (first used in the tramway of Bordeaux), the safety problem is avoided by splitting the power rail into small segments, each of which is only powered when fully covered by a train. There is also a risk of pedestrians walking onto the tracks at level crossings. In the US, a 1992 Supreme Court of Illinois decision affirmed a $1.5 million verdict against the Chicago Transit Authority for failing to stop an intoxicated person from walking onto the tracks at a level crossing in an attempt to urinate. The Paris Metro has graphic warning signs pointing out the danger of electrocution from urinating on third rails, precautions which Chicago did not have. The end ramps of conductor rails (where they are interrupted, or change sides) present a practical limitation on speed due to the mechanical impact of the shoe, and 160 km/h (99 mph) is considered the upper limit of practical third-rail operation. The world speed record for a third rail train is 174 km/h (108 mph) attained on 11 April 1988 by a British Class 442 EMU. In the event of a collision with a foreign object, the beveled end ramps of bottom running systems can facilitate the hazard of having the third rail penetrate the interior of a passenger car. This is believed to have contributed to the death of five passengers in the Valhalla train crash of 2015. Third rail systems using top contact are prone to accumulations of snow, or ice formed from refrozen snow, and this can interrupt operations. Some systems operate dedicated de-icing trains to deposit an oily fluid or antifreeze (such as propylene glycol) on the conductor rail to prevent the frozen build-up. The third rail can also be heated to alleviate the problem of ice. Unlike third rail systems, overhead line equipment can be affected by strong winds or freezing rain bringing the wires down and stopping all trains. Thunderstorms can also disable the power with lightning strikes on systems with overhead wires, disabling trains if there is a power surge or a break in the wires. Because of the gaps in the conductor rail (e.g., at level crossings and junctions) a train can stop in a position where all of its power pickup shoes are in gaps, so that no traction power is available. The train is then said to be "gapped". Another train must then be brought up behind the stranded train to push it on to the conductor rail, or a jumper cable may be used to supply enough power to the train to get one of its contact shoes back on the third rail. Avoiding this problem requires a minimum length of trains that can be run on a line. Locomotives have either had the backup of an on-board diesel engine system (e.g., British Rail Class 73), or have been connected to shoes on the rolling stock (e.g. Metropolitan Railway). The first idea for feeding electricity to a train from an external source was by using both rails on which a train runs, whereby each rail is a conductor for each polarity, and is insulated by the sleepers. This method is used by most scale model trains, however it does not work so well for large trains as the sleepers are not good insulators. Furthermore, the electric connection requires insulated wheels or insulated axles, but most insulation materials have poor mechanical properties compared with metals used for this purpose, leading to a less stable train vehicle. Nevertheless, it was sometimes used at the beginning of the development of electric trains. The oldest electric railway in the world, the Volk's Railway in Brighton, England was originally electrified at 50 volts DC using this system (it is now a three rail system). Other railway systems that used it were the Gross-Lichterfelde Tramway and the Ungerer Tramway. Contact shoe on Metro-North M8 railcar, designed for both over- and under-running third rail. The third rail is usually located outside the two running rails, but on some systems it is mounted between them. The electricity is transmitted to the train by means of a sliding shoe, which is held in contact with the rail. On many systems, an insulating cover is provided above the third rail to protect employees working near the track; sometimes the shoe is designed to contact the side (called "side running") or bottom (called "bottom running" or "under-running") of the third rail, allowing the protective cover to be mounted directly to its top surface. When the shoe slides along the top surface, it is referred to as "top running". When the shoe slides along the bottom surface, it is less affected by the build-up of snow, ice, or leaves, and reduces the chances of a person being electrocuted by coming in contact with the rail. Examples of systems using under-running third rail include Metro-North in the New York metropolitan area; the SEPTA Market-Frankford Line in Philadelphia; and London's Docklands Light Railway. Electric traction systems (where electric power is generated at a remote power station and transmitted to the trains) are considerably more cost-effective than diesel or steam units, where separate power units must be carried on each train. This advantage is especially marked in urban and rapid transit systems with a high traffic density. Because of mechanical limitations on the contact to the third rail, trains that use this method of power supply achieve lower speeds than those using overhead electric wires and a pantograph. Nevertheless, they may be preferred inside the cities as there is no need for very high speed and they cause less visual pollution. The third rail is an alternative to overhead lines that transmit power to trains by means of pantographs attached to the trains. Whereas overhead-wire systems can operate at 25 kV or more, using alternating current (AC), the smaller clearance around a live rail imposes a maximum of about 1500 V (Line 4, Guangzhou Metro, Line 5, Guangzhou Metro, Line 3, Shenzhen Metro), and direct current (DC) is used. Trains on some lines or networks use both power supply modes (see § Mixed systems below). All third rail systems throughout the world are energised with DC supplies. Some of the reasons for this are historical. Early traction engines were DC motors, and the then available rectifying equipment was large, expensive and impractical to install onboard trains. Also, transmission of the relatively high currents required results in higher losses with AC than DC. Substations for a DC system will have to be (typically) about 2 kilometres (1.2 mi) apart, though the actual spacing depends on the carrying capacity; maximum speed and service frequency of the line. The Docklands Light Railway (DLR) uses a third rail which is tiny in section compared with the usual; thus fewer substations are required. The DLR was able to do this (in the 1980s) because it was a totally new build with custom-built trains and had no need for a formal connection to an existing 'heavy' third rail system. One method for reducing current losses (and thus increase the spacing of feeder/sub stations, a major cost in third rail electrification) is to use a composite conductor rail of a hybrid aluminium/steel design. The aluminium is a better conductor of electricity, and a running face of stainless steel gives better wear. There are several ways of attaching the stainless steel to the aluminium. The oldest is a co-extruded method, where the stainless steel is extruded with the aluminium. This method has suffered, in isolated cases, from de-lamination (where the stainless steel separates from the aluminium); this is said to have been eliminated in the latest co-extruded rails. A second method is an aluminium core, upon which two stainless steel sections are fitted as a cap and linear welded along the centre line of the rail. Because aluminium has a higher coefficient of thermal expansion than steel, the aluminium and steel must be positively locked to provide a good current collection interface. A third method rivets aluminium bus strips to the web of the steel rail. As with overhead wires, the return current usually flows through one or both running rails, and leakage to ground is not considered serious. Where trains run on rubber tyres, as on parts of the Lyon Metro, Paris Métro, Mexico City metro, Santiago Metro, Sapporo Municipal Subway, and on all of the Montreal Metro and some automated guideway transit systems (e.g. the Astram Line), a live rail must be provided to feed the current. The return is effected through the rails of the conventional track between these guide bars (see rubber-tyred metro). Another design, with a third rail (current feed, outside the running rails) and fourth rail (current return, midway between the running rails), is used by a few steel-wheel systems; see fourth rail. The London Underground is the largest of these, (see railway electrification in Great Britain). The main reason for using the fourth rail to carry the return current is to avoid this current flowing through the original metal tunnel linings which were never intended to carry current, and which would suffer electrolytic corrosion should such currents flow in them. Another four-rail system is line M1 of the Milan Metro, where current is drawn by a lateral, flat bar with side contact, with return via a central rail with top contact. Along some sections on the northern part of the line an overhead line is also in place, to allow line M2's trains (that use pantographs and higher voltage, and have no contact shoes) to access a depot located on line M1. In depots, line M1 trains use pantographs because of safety reasons, with transition made near the depots away from revenue tracks. Third rail electrification is less visually obtrusive than overhead electrification. In 2011, greenery and aesthetics inspired the Bangalore Metro in India to incorporate a third rail system. Several systems use a third rail for part of the route, and other motive power such as overhead catenary or diesel power for the remainder. These may exist because of the connection of separately-owned railways using the different motive systems, local ordinances, or other historical reasons. Several types of British trains have been able to operate on both overhead and third rail systems, including class British Rail Class 313, 319, 325, 350, 365, 375/6, 377/2, 377/5, 377/7, 378/2, 387, 373, 395 and 700 EMUs, plus Class 92 locomotives. On the southern region of British Rail, freight yards had overhead wiring to avoid the hazards of a third rail. The locomotives were fitted with a pantograph as well as pick-up shoes. The Class 373 used for international services operated by Eurostar via the Channel Tunnel uses overhead collection at 25 kV AC for most of its journey, with sections of 3 kV DC on Belgian lines between the Belgian high speed section and Brussels Midi station or 1.5 kV DC on southern French lines for seasonal services. As originally delivered, the Class 373 units were additionally fitted with 750 V DC collection shoes, designed for the journey in London via the suburban commuter lines to Waterloo. A switch between third-rail and overhead collection was performed while running at speed, initially at Continental Junction near Folkestone, and later on at Fawkham Junction after the opening of the first section of the Channel Tunnel Rail Link. Between Kensington Olympia railway station and North Pole depot further switchovers were necessary. The dual system did cause some problems. Failure to retract the shoes when entering France caused severe damage to trackside equipment, leading to SNCF installing a pair of concrete blocks at the Calais end of both tunnels to break off the third rail shoes if they had not been retracted. An accident occurred in the UK when a Eurostar driver failed to retract the pantograph before entering the third rail system, damaging a signal gantry and the pantograph. On 14 November 2007, Eurostar's passenger operations were transferred to St Pancras railway station and maintenance operations to Temple Mills depot making the 750 VDC third rail collection equipment redundant and leading to its removal from the fleet. All speed limits on the English Eurostar lines are posted in km/h and the lineside signs on non high speed sections are white numerals on a black background (instead of the UK standard black numerals on a white background) as a reminder. The trains themselves are no longer fitted with a speedometer capable of indicating in miles per hour (the indication used to change automatically when the collector shoes were deployed). In 2009, Southeastern began operating domestic services over High Speed 1 trackage from St Pancras using its new Class 395 EMUs. These services operate on the High Speed line as far as Ebbsfleet International or Ashford International, before transferring to the classic lines to serve north and mid Kent. As a consequence, these trains are dual voltage enabled, as the majority of the routes over which they operate are third rail electrified. Also in London, the West London Line changes power supply between Shepherd's Bush and Willesden Junction, where it meets the North London Line. South of the changeover point, the WLL is third rail electrified, north of there, it is overhead. The cross-city Thameslink service runs on the Southern Region third rail network from Farringdon southwards and on overhead line northwards to Bedford. The changeover is made whilst stationary at Farringdon when heading southbound, and at City Thameslink when heading northbound. On the Moorgate to Hertford and Welwyn suburban service routes, the East Coast Main Line sections are 25 kV AC, with a changeover to third rail made at Drayton Park railway station. A third rail is still used in the tunnel section of the route, because the size of the tunnels leading to Moorgate station was too small to allow overhead electrification. Redhill with the diesel Class 166 service run by First Great Western to Reading as the North Downs Line only has third rail electrification on shared sections. The North Downs Line is not electrified on those parts of the line where the North Downs service has exclusive use. Redhill to Reigate - Allows Southern Railway services to run to Reigate. This saves having to turn terminating services at Redhill where due to the station layout, the reversal would block nearly all the running lines. Shalford Junction to Aldershot South Junction - line shared with South West Trains electric Portsmouth and Aldershot services. Wokingham to Reading - line shared with South West Trains electric services from Waterloo. The Stockholm metro is served by a third rail system. The new tramway in Bordeaux (France) uses a novel system with a third rail in the center of the track. The third rail is separated into 10 m (32 ft 10 in) long conducting and 3 m (9 ft 10 in) long isolation segments. Each conducting segment is attached to an electronic circuit which will make the segment live once it lies fully beneath the tram (activated by a coded signal sent by the train) and switch it off before it becomes exposed again. This system (called "Alimentation par Sol" (APS), meaning "current supply via ground") is used in various locations around the city but especially in the historic centre: elsewhere the trams use the conventional overhead lines, see also ground-level power supply. In summer 2006 it was announced that two new French tram systems would be using APS over part of their networks. These will be Angers and Reims, with both systems expected to open around 2009–2010. The French Culoz–Modane railway was electrified with 1500 V DC third rail, later converted to overhead wires at the same voltage. Stations had overhead wires from the beginning. The French branch line which serves Chamonix and the Mont Blanc region (Saint-Gervais-le-Fayet to Vallorcine) is third rail (top contact) and metre gauge. It continues in Switzerland, partly with the same third rail system, partly with an overhead line. The 63 km (39 mi) long Train Jaune line in the Pyrenees also features a third rail. To mitigate investment costs, the Rotterdam Metro, basically a third-rail-powered system, has been given some outlying branches built on surface as light rail (called Sneltram in Dutch), with numerous level crossings protected with barriers and traffic lights. These branches have overhead wires. Similarly, in Amsterdam one "Sneltram" route goes on Metro tracks and passes to surface alignment in the suburbs, which it shares with standard trams. In most recent developments, the RandstadRail project also requires Rotterdam Metro trains to run under wires on their way along the former mainline railway to The Hague. Sneltram is operated by Gemeentelijk Vervoerbedrijf in Amsterdam lightrail with third rail and switching to overhead on the traditional tramway shared with Trams in Amsterdam. Line 51 to Amstelveen runs metro service between Amsterdam Centraal and Station Zuid. At Amsterdam Zuid it switches from third rail to pantograph and catenary wires. From there to Amstelveen Centrum it shares its track with tram line 5. The light rail vehicles on this line are capable of using both 600 V DC and 750 V DC. In all the subways of post-Soviet countries, the contact rail is made to the same standard. In particular, because carbon impurities increase electrical resistance, all third rails are made using low-carbon steel. Perhaps[weasel words] in some metros of the former Soviet Union profile and cross section of conductor rail are the same parameters of conventional track. The natural, pre-installation length of the conductor rail is 12.5 meters (41 ft). During installation, the contact rail segments are welded together to produce conductor rails of varying length. In curved sections with a radius of 300 meters (980 ft) or more, straightaways, and tunnels, the contact rail is welded to a length of 100 meters (330 ft); at surface running, 37.5 metres (123 ft); and, on tight curves and park paths, 12.5 meters (41 ft). Post-Soviet third rail installations use the bottom-contact (Wilgus-Sprague) system; on top of the rail is high strength plastic casing with sufficient structural integrity to support a man's weight. Voltage is 825 volts DC. In New York City, electric trains that must use the third rail leaving Grand Central Terminal on the former New York Central Railroad (now Metro-North Railroad) switch to overhead lines at Pelham when they need to operate out onto the former New York, New Haven and Hartford Railroad (now Metro North's New Haven Line) line to Connecticut. The switch is made "on the fly", and controlled from the engineer's position. Also in New York City where diesel exhaust would pose a health hazard in underground station areas, Metro-North, Long Island Rail Road and Amtrak use special diesel locomotives that can also be electrically powered by third-rail. This kind of locomotive (for example the General Electric P32AC-DM or the EMD DM30AC of LIRR), can transition between the two modes while underway. The third-rail auxiliary system is not as powerful as the diesel engine, so on open-air (non-tunnel) trackage the engines typically run in diesel mode, even where third rail power is available. In New York City, and in Washington, D.C., local ordinances once required electrified street railways to draw current from a third rail and return the current to a fourth rail, both installed in a continuous vault underneath the street and accessed by means of a collector that passed through a slot between the running rails. When streetcars on such systems entered territory where overhead lines were allowed, they stopped over a pit where a man detached the collector (plow) and the motorman placed a trolley pole on the overhead. In the US, all these conduit feed powered systems have been discontinued, and either replaced or abandoned altogether. Some sections of the former London tram system also used the conduit current collection system, also with some tramcars that could collect power from both overhead and under-road sources. The Blue Line of Boston's MBTA uses third rail electrification from the start of the line downtown to Airport station, where it switches to overhead catenary for the remainder of the line to Wonderland. The outermost section of the Blue Line runs very close to the Atlantic Ocean, and there were concerns about possible snow and ice buildup on a third rail so near to the water. Overhead catenary is not used in the underground section, because of tight clearances in the 1904 tunnel under Boston Harbor. The MBTA Orange Line's Hawker Siddeley 01200 series rapid transit cars (essentially a longer version of the Blue Line's 0600's) recently had their pantograph mounting points removed during a maintenance program; these mounts would have been used for pantographs which would have been installed had the Orange Line been extended north of its current terminus. Dual power supply method was also used on some US interurban railways that made use of newer third rail in suburban areas, and existing overhead streetcar (trolley) infrastructure to reach downtown, for example the Skokie Swift in Chicago. Bay Area Rapid Transit in and around San Francisco uses 1000 V DC. A railway can be electrified with an overhead wire and a third rail at the same time. This was the case, for example, on the Hamburg S-Bahn between 1940 and 1955. A modern example is Birkenwerder Railway Station near Berlin, which has third rails on both sides and overhead wires. Most of the Penn Station complex in New York City is also electrified with both systems. However, such systems have problems with the interaction of the different electrical supplies. If one supply is DC and the other AC, an undesired premagnetization of the AC transformers can occur. For this reason, dual electrification is usually avoided. Despite various technical possibilities for operating rolling stock with dual power collecting modes, a desire to achieve full compatibility of entire networks seems to have been the incentive for conversions from third rail to overhead supply (or vice versa). Suburban corridors in Paris from Gare Saint-Lazare, Gare des Invalides (both CF Ouest) and Gare d'Orsay (CF PO), were electrified from 1924, 1901, 1900 respectively. They all changed to overhead wires by stages after they became part of a wide scale electrification project of the SNCF network in the 1960s–70s. In the Manchester area, the L&YR Bury line was first electrified with overhead wires (1913), then changed to third rail (1917; see also Railway electrification in Great Britain) and then back again in 1992 to overhead wires in the course of its adaptation for the Manchester Metrolink. Trams in city centre streets, carrying collector shoes projecting from their bogies, were considered too dangerous for pedestrians and motor traffic to attempt dual-mode technology (in Amsterdam and Rotterdam Sneltram vehicles go out to surface in suburbs, not in busy central areas). The same thing happened to the West Croydon – Wimbledon Line in Greater London (originally electrified by the Southern Railway) when Tramlink was opened in 2000. Three lines out of five making up the core of Barcelona Metro network changed to overhead power supply from third rail. This operation was also done by stages and completed in 2003. The opposite transition took place in South London. The South London Line of the LBSCR network between Victoria and London Bridge was electrified with catenary in 1909. The system was later extended to Crystal Palace, Coulsdon North and Sutton. In the course of mainline third rail electrification in southeast England, the lines were converted by 1929. The reasons for building the overhead powered Tyne & Wear Metro network roughly on lines of the long-gone third-rail Tyneside Electrics system in Newcastle area are likely to have roots in economy and psychology rather than in the pursuit of compatibility. At the time of the Metro opening (1980), the third rail system had already been removed from the existing lines, there were no third-rail light rail vehicles on the market and the latter technology was confined to much more costly heavy rail stock. Also the far-going change of image was desired: the memories of the last stage of operation of the Tyneside Electrics were far from being favourable. This was the construction of the system from scratch after 11 years of ineffective diesel service. The first overhead feed to German electric trains appeared on the Hamburg-Altonaer Stadt- und Vorortbahn in 1907. Thirty years later, the main-line railway operator, Deutsche Reichsbahn, influenced by the success of the third-rail Berlin S-Bahn, decided to switch what was now called Hamburg S-Bahn to third rail. The process began in 1940 and was not finished until 1955. In 1976–1981, the third-rail Vienna U-Bahn U4 Line substituted the Donaukanallinie and Wientallinie of the Stadtbahn, built c1900 and first electrified with overhead wires in 1924. This was part of a big project of consolidated U-Bahn network construction. The other electric Stadtbahn line, whose conversion into heavy rail stock was rejected, still operates under wires with light rail cars (as U6), though it has been thoroughly modernised and significantly extended. As the platforms on the Gürtellinie were not suitable for raising without much intervention into historic Otto Wagner's station architecture, the line would anyway remain incompatible with the rest of the U-Bahn network. Therefore, an attempt of conversion to third rail would have been pointless. In Vienna, paradoxically, the wires were retained for aesthetic (and economic) reasons. The older lines in the west of the Oslo T-bane system were built with overhead lines while the eastern lines were built with third rail, although the entire system has since been converted to third rail. Prior to the conversion, the now-retired OS T1300 and OS T2000 trains could operate on both systems. 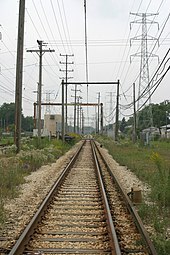 The western portion of the Skokie Swift of the Chicago 'L' changed from catenary wire to third rail in 2004, making it fully compatible with the rest of the system. In Germany during the early Third Reich, a railway system with a 3,000 mm (9 ft 10 1⁄8 in) gauge width was planned. For this Breitspurbahn railway system, electrification with a voltage of 100 kV taken from a third rail was considered, in order to avoid damage to overhead wires from oversize rail-mounted anti-aircraft guns. However such a power system would not have worked, as it is not possible to insulate a third rail for such high voltages in close proximity to the rails. The whole project did not progress any further owing to the onset of World War II. With surface contact third and fourth rail systems a heavy "shoe" suspended from a wooden beam attached to the bogies collects power by sliding over the top surface of the electric rail. This view shows a British Rail Class 313 train. The London Underground uses a four-rail system where both conductor rails are live relative to the running rails, and the positive rail has twice the voltage of the negative rail. Arcs like this are normal and occur when the electric power collection shoes of a train that is drawing power reach the end of a section of conductor rail. Third-rail electrification systems are, apart from on-board batteries, the oldest means of supplying electric power to trains on railways using their own corridors, particularly in cities. Overhead power supply was initially almost exclusively used on tramway-like railways, though it also appeared slowly on mainline systems. An experimental electric train using this method of power supply was developed by the German firm of Siemens & Halske and shown at the Berlin Industrial Exposition of 1879, with its third rail between the running rails. Some early electric railways used the running rails as the current conductor, as with the 1883-opened Volk's Electric Railway in Brighton. It was given an additional power rail in 1886, and is still operating. The Giant's Causeway Tramway followed, equipped with an elevated outside third rail in 1883, later converted to overhead wire. The first railway to use the central third rail was the Bessbrook and Newry Tramway in Ireland, opened in 1885 but now, like the Giant's Causeway line, closed. Also in the 1880s, third-rail systems began to be used in public urban transport. Trams were first to benefit from it: they used conductors in conduit below the road surface (see Conduit current collection), usually on selected parts of the networks. This was first tried in Cleveland (1884) and in Denver (1885) and later spread to many big tram networks (e.g. New York, Chicago, Washington DC, London, Paris, all of which are closed) and Berlin (the third rail system in the city was abandoned in the first years of the 20th century after heavy snowfall.) The system was tried in the beachside resort of Blackpool, UK but was soon abandoned as sand and saltwater was found to enter the conduit and cause breakdowns, and there was a problem with voltage drop. Some sections of tramway track still have the slot rails visible. A third rail supplied power to the world's first electric underground railway, the City & South London Railway, which opened in 1890 (now part of the Northern line of the London Underground). In 1893, the world's second third-rail powered city railway opened in Britain, the Liverpool Overhead Railway (closed 1956 and dismantled). The first US third-rail powered city railway in revenue use was the 1895 Metropolitan West Side Elevated, which soon became part of the Chicago 'L'. In 1901, Granville Woods, a prominent African-American inventor, was granted a U.S. Patent 687,098, covering various proposed improvements to third rail systems. This has been cited to claim that he invented the third rail system of current distribution. However, by that time there had been numerous other patents for electrified third-rail systems, including Thomas Edison's U.S. Patent 263,132 of 1882, and third rails had been in successful use for over a decade, in installations including the rest of Chicago 'elevateds', as well as those used in Brooklyn Rapid Transit Company, not to mention the development outside the US. In Paris, a third rail appeared in 1900 in the main-line tunnel connecting the Gare d'Orsay to the rest of the CF Paris-Orléans network. Main-line third-rail electrification was later expanded to some suburban services. The Woodford haulage system was used on industrial tramways, specifically in quarries and strip mines in the early decades of the 20th century. This used a 250 Volt center third rail to power remotely-controlled self-propelled side dump cars. The remote control system was operated like a model railroad, with the third rail divided into multiple blocks that could be set to power, coast, or brake by switches in the control center. Top contact or gravity type third rail seems to be the oldest form of power collection. Railways pioneering in using less hazardous types of third rail were the New York Central Railroad on the approach to New York's Grand Central Terminal (1907 – another case of a third-rail mainline electrification), Philadelphia's Market Street Subway-Elevated (1907), and the Hochbahn in Hamburg (1912) — all had bottom contact rail, also known as the Wilgus-Sprague system. However, the Manchester-Bury Line of the Lancashire & Yorkshire Railway tried side contact rail in 1917. These technologies appeared in wider use only at the turn of the 1920s and in the 1930s on, e.g., large-profile lines of the Berlin U-Bahn, the Berlin S-Bahn and the Moscow Metro. The Hamburg S-Bahn has used a side contact third rail at 1200 V DC since 1939. In 1956 the world's first rubber-tyred railway line, Line 11 of Paris Metro, opened. The conductor rail evolved into a pair of guiding rails required to keep the bogie in proper position on the new type of track. This solution was modified on the 1971 Namboku Line of Sapporo Subway, where a centrally placed guiding/return rail was used plus one power rail placed laterally as on conventional railways. The third-rail technology at street tram lines has recently been revived in the new system of Bordeaux (2004). This is a completely new technology (see below). Third-rail systems are not considered obsolete. There are, however, countries (particularly Japan, South Korea, Spain) more eager to adopt overhead wiring for their urban railways. But at the same time, there were (and still are) many new third rail systems built elsewhere, including technologically advanced countries (e.g. Copenhagen Metro, Taipei Metro, Wuhan Metro). Bottom powered railways (it may be too specific to use the term 'third rail') are also usually used with systems having rubber-tyred trains, whether it is a heavy metro (except two other lines of Sapporo Subway) or a small capacity people mover (PM). New electrified railway systems tend to use overhead for regional and long-distance systems. Third-rail systems using lower voltages than overhead systems still require many more supply points. In 1906, the Lionel electric trains became the first model trains to use a third rail to power the locomotive. Lionel track uses a third rail in the center, while the two outer rails are electrically connected together. This solved the problem two-rail model trains have when the track is arranged to loop back on itself, as ordinarily this causes a short-circuit. (Even if the loop was gapped, the locomotive would create a short and stop as it crossed the gaps.) Lionel electric trains also operate on alternating current. The use of alternating current means that a Lionel locomotive cannot be reversed by changing polarity; instead, the locomotive sequences among several states (forward, neutral, backward, for example) each time it is started. Märklin three-rail trains use a short spike of DC voltage to reverse a relay within the locomotive while it is stopped. 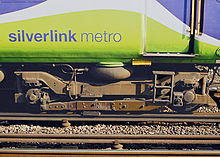 Märklin's track does not have an actual third rail; instead, a series of short pins provide the current, taken up by a long "shoe" under the engine. This shoe is long enough to always be in contact with several pins. This is known as the stud contact system and has certain advantages when used on outdoor model railway systems. The ski collector rubs over the studs and thus inherently self cleans. When both track rails are used for the return in parallel there is much less chance of current interruption due to dirt on the line. Many model train sets today use only two rails, usually associated with Z, N, HO or G-Gauge systems. These are typically powered by direct current (DC) where the voltage and polarity of the current controls the speed and direction of the DC motor in the train. A growing exception is Digital Command Control (DCC), where bi-polar DC is delivered to the rails at a constant voltage, along with digital signals that are decoded within the locomotive. The bi-polar DC carries digital information to indicate the command and the locomotive that is being commanded, even when multiple locomotives are present on the same track. The aforementioned Lionel O-Gauge system remains popular today as well. With its three rail track and AC power implementation. Some model railroads realistically mimic the third rail configurations of their full-sized counterparts although most do not draw power from the third rail. ^ a b Middleton, William D. (9 September 2002). "Railroad Standardization – Notes on Third Rail Electrification". Railway & Locomotive Historical Society Newsletter. 27 (4): 10–11. ^ Lee v. Chicago Transit Authority, 152 Ill.2d 432, 605 N.E.2d 493 (1992). ^ "Investigating the Metro-North Crash". New York Times. 4 February 2015. Retrieved 15 February 2015. ^ Middleton, William D. (4 September 2002). "Railroad Standardization - Notes on Third Rail Electrification" (PDF). Railway & Locomotive Historical Society Newsletter. 27 (4): 10–11. Archived from the original (PDF) on 16 March 2009. Retrieved 22 August 2009. ^ Yadav, Anil. "Traction choices: overhead ac vs third rail dc". Retrieved 3 September 2018. ^ Dunn, Pip (2013). British Rail Main Line Locomotives Specification Guide. The Crowood Press Ltd. p. 145. ISBN 978-1847975478. ^ F. E. Woodford, An Electric Haulage System: Controlling Cars at a Distance From a Central Station, Scientific American Supplement, No. 2115, July 15, 1916; page 40. ^ An Electrically-Operated Quarry and Plant for Production of Broken Stone at Gary, Ill., Engineering News, Vol. 62, No. 17; Oct. 21, 1909; page 421-428. ^ Cudahy, Brian J. (2003). A Century of Subways: Celebrating 100 Years of New York's Underground Railways. New York: Fordham University Press. p. 202. ISBN 0-8232-2292-6. Wikimedia Commons has media related to Third rail. Look up third rail in Wiktionary, the free dictionary. Details of the UK 3rd/4th rail design.